CAGAYAN de Oro City Mayor Oscar Moreno and his running mate Raineir Joaquin Uy were a no-show during the second round of the solidarity walk for peace and covenant signing at the Kiosko Kagawasan in Divisoria, over the weekend, two weeks before the local campaign starts. The administration’s congressional bet for the first and second district, Rolando Uy and Alam Lim also did not join the activity. But, some members of the administration ticket who are seeking city council seats have attended. Majority of the opposition slate led by mayoral candidate Jose Gabriel La Viña have participated. While some independent candidates were also present. However, candidates were not recognized and no one was given the time to speak before the crowd, unlike the first unity walk last January 13, where Moreno was called on the stage to welcome the participants. 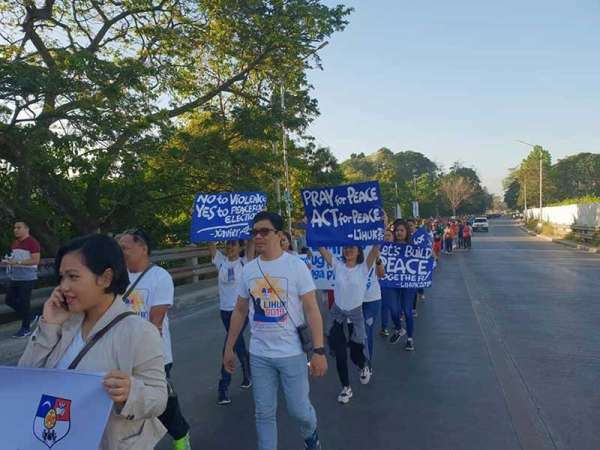 The solidarity walk for peace was jointly organized by the Cagayan de Oro City Police Office (Cocpo), National Citizens’ Movement for Free Elections (Namfrel), Parish Pastoral Council for Responsible Voting (PPCRV), religious leaders, academe and other stakeholders. City police director Senior Superintendent Nelson Aganon said the solidarity walk emphasizes neutrality. All solidarity messages from the organizer’s representative boils to one call a clean, honest, credible and peaceful elections this May. “Itong 2nd unity walk, we emphasize neutrality, nobody talks from the politicians pagpapakita ito na dito sa Cagayan de Oro we really meant neutrality. We don’t go for the color,” Aganon said. Candidates have affixed their signatures to signify their vows to follow all election rules and regulations. They also release white doves as a symbol of peace. Speaking to reporters, La Viña said he joined the solidarity walk to show support for a fair and honest midterm elections. “Dili man mi kontra personal. I would be happy to walk with him,” La Viña said. The aspiring mayor also said he is willing to face Moreno in a debate. “Kagay-anon ang magbuot if they want a debate I’ll be there because I have nothing to hide. I am also willing to undergo a lie detector test aron mahibal-an if I have taken a single peso from the government,” he added. Moreno has yet to reply when asked for comment. Aganon said after the solidarity walk, Cocpo will now focus on security preparations for all poll-related activities including deployment of police in campaign sorties of the candidates. “We will give security sa lahat ng candidates regardless of political affiliations sa mga area na mag conduct sila ng campaign,” Aganon said. The police official said there is no particular threat for the conduct of elections in the city, but the police will still monitor the hinterland villages which remain bothered by sightings of communist rebels. “Alam naman natin na hinterland barangays are still bothered by NPA sightings but we have the military and task force Oro at nama-manage naman yan,” Aganon said. “We will do our best na ma-exercise nila ang right to suffrage sa mga barangays na ito,”he added.